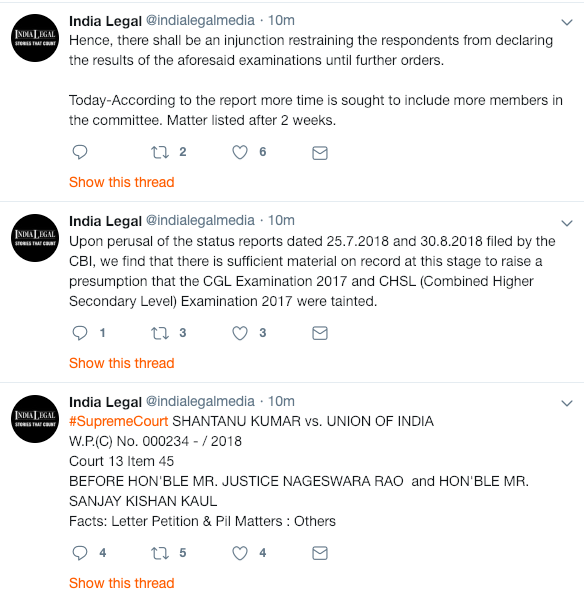 Upon perusal of the status reports dated 25.7.2018 and 30.8.2018 filed by the CBI, we find that there is sufficient material on record at this stage to raise a presumption that the CGL Examination 2017 and CHSL (Combined Higher Secondary Level) Examination 2017 were tainted. Hence, there shall be an injunction restraining the respondents from declaring the results of the aforesaid examinations until further orders. Today-According to the report more time is sought to include more members in the committee. Matter listed after 2 weeks.